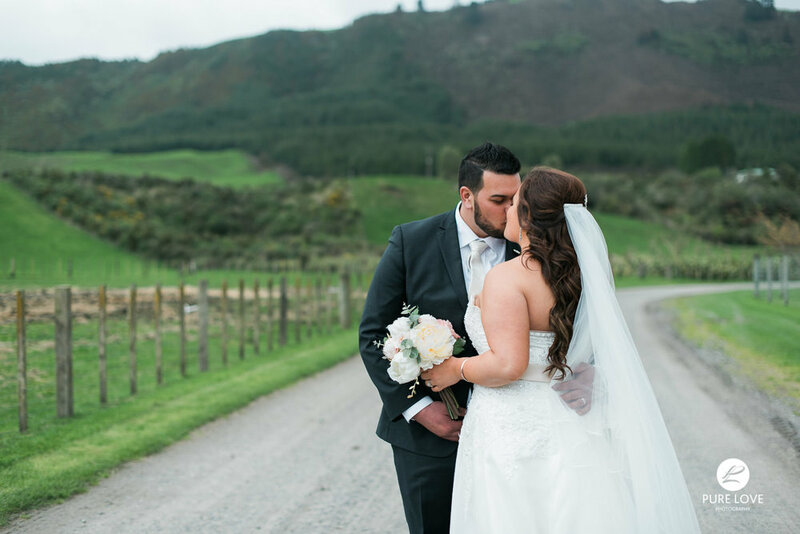 Eden and Nathan were married on October 7th with a gathering of family and friends at the Redwood Forest in Rotorua surrounded by bird song, fresh air and laughter. A picturesque location run by Event Impressions that radiates natural beauty and mood. On the day of the wedding Eden got ready in a charming house on the hill in Tihiotonga surrounded by her bridesmaids, daughter and family. Dressed in patterned kimono's Eden had Tatiana Te Kowhai do their make up and hair was adorned with delicate flower details by Elixir Hair and Beauty. Eden's bridesmaid got dressed into her flowy, blush Pagani dress and Eden into her elegant beaded piece by a Xian Bridal. Eden radiated a bright happiness on her wedding day next to her beautiful daughter, who was dressed in cream by Lula's Upcycled Linen. It was very important for Eden and Nathan to have their daughter share their special day. The Bridal party had lovely, pastel bouquets by Keepsake Bouquets as well as the buttonholes for Nathan and his Groomsman. Nathan got ready separately at his mother's in Hannah's Bay in a suit by Whararei Menswear & Suit Hire patiently awaiting the time he would meet Eden at the aisle. The ceremony was held under the sails at the Redwood Forest with a quiet breeze surrounded by forest air- a stunning place for Eden and Nathan to begin the rest of their lives together. The ceremony started with a blessing in Maori followed with a special presentation by Eden and Nathan of a bracelet to their daughter as a promise, a moving moment for everyone who witnessed it. The photos commenced after the ceremony at the Redwood Forest where light filtered through the trees beautifully. The birds sang, the bride and groom laughed and the golden light made their shoot even more magical as they laughed before the trees. The pastels of the dresses and flowers contrasted against the moodiness of the forest and brought a bright lightness to the pleasant spring day. We moved on to Adventure Playground to photograph before a rustic old shed and showcased the down to earth happiness this family has. Their photoshoot was completed before the Rotorua Lake where we captured a few more stunning shots. The reception was held at Rydges Hotel where the night was filled with speeches and blessings, followed by dancing and singing after the cake, made by Baked, was cut. If you enjoyed Eden and Nathan's wedding photos, leave a comment for the beautiful bride and groom. We are sure they would love to hear from you!